1 tsp salt plus more for sprinkling over eggplant. Heat a deep, heavy bottomed skillet or a dutch oven over medium/high heat. Add enough oil to cover the bottom of the pan. Once the oil is hot, arrange eggplant on the skillet and fry about 2 minutes per side. Caution: wear and apron and your cooking mitts and make sure babies have cleared the area (this is a time of substantial oil fireworks). Remove cooked eggplant to a pyrex dish (you may place it on paper towels to soak up excess oil). Add more oil to the skillet between batches as needed. Grate 3 red bell peppers and 1 jalapeno (use a food processor with a grater attachment if you have one). In a medium sauce pan mix grated bell peppers, jalapeño, 5 pressed cloves of garlic, 1 tsp salt, 1 Tbsp sugar, 1/4 tsp pepper, 1/3 cup vinegar, 1/3 cup olive oil, and 1/2 cup water . Simmer sauce uncovered for 40 minutes (stirring occasionally). Add more sugar and water to taste in the end. 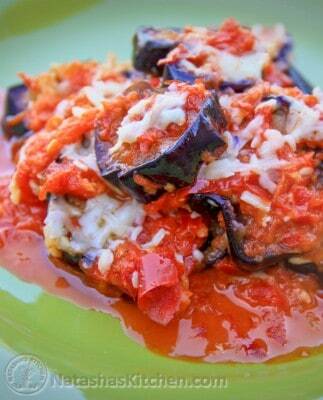 Add 1/2 eggplant slices to 9×13 or 9×12 casserole dish then top with 1/2 red pepper sauce. Repeat with remaining eggplant slices and pepper sauce. Sprinkle the top with freshly grated parmesan cheese and place the dish in the oven on broil for 3 minutes to melt the cheese.